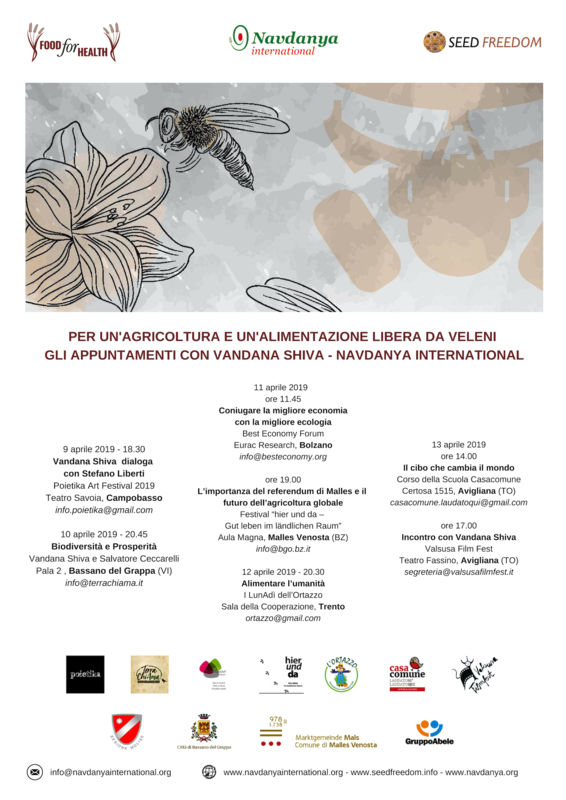 Vandana Shiva, president of Navdanya International, was in Italy from 9 to 13 April to promote the international Campaign for “Poison-free Food and Farming“. An ecological mobilization tour that touched several Italian destinations: Campobasso, Bassano del Grappa, Bolzano, Malles, Trento and Turin. 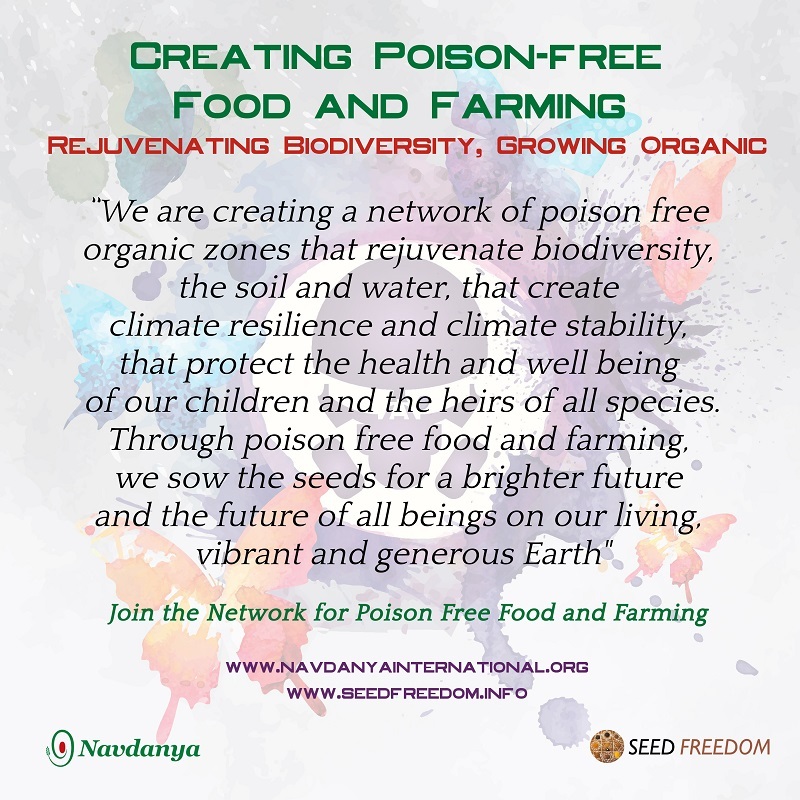 The Campaign is part of Navdanya International’s work in recent years towards a healthier and more equitable agricultural, food and social model, in close collaboration with civil society organisations, experts, farmers and producers from around the world. The Poison-free Food and Farming 2030 Campaign is an invitation to create a unified global movement for change in the food-production paradigm, currently dominated by giant agro-business corporations, which are now able to influence political choices and thus subvert people’s democratic rights. On 13 April, Vandana Shiva joined with Don Ciotti in Turin in a conference on the ecological value of Pope Francis’ “Laudato si” encyclical. The event organized in Veneto on April 10, was a continuation of the press conference with Vandana Shiva and organized by Navdanya International, held on March 7 at the Chamber of Deputies in Rome which saw the participation of representatives of local movements of Veneto, who are protesting against the massive use of pesticides in the prosecco cultivation areas. From vineyard monoculture of Veneto to that of apples in South Tyrol. The press conference of March was also attended by Ulrich Veith, Mayor of Mals: on 11 April, Dr. Shiva visited the village of Mals in Venosta valley, where she met with the mayor, who recently promulgated a referendum to ban the use of pesticides in the municipality. 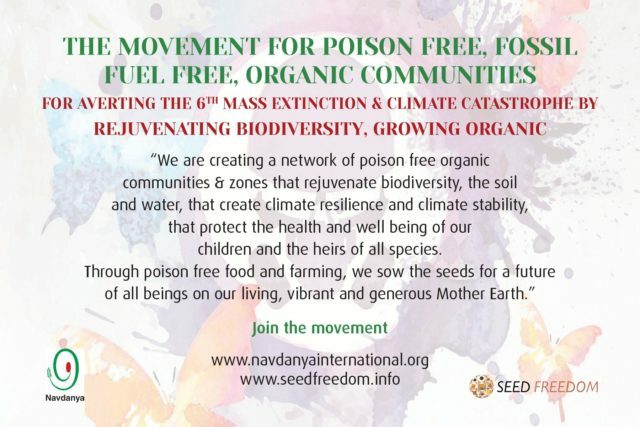 As early as October 2017, in New Delhi, India, Navdanya brought together communities of the Alps, represented by the mayor of Mals and communities of the Himalayas who cultivate the land without chemicals, to join forces and take a pledge to start a network of poison-free, organic communities at the global level. The meeting of April 11th was an opportunity to jointly sign a renewed commitment for an immediate transition to agro-ecological production models that respect biodiversity and counter climate change. The event organized by the Best Economy Forum in Bolzano, on the morning of April 11, hosted Vandana Shiva to discuss the economic implications of the transition to an ecological and sustainable production model: the recent Food for Health manifesto shows that the transition is not only convenient for the health of people and the planet, but also for the economy. In addition to benefiting the economy, can agroecology succeed where conventional agriculture has failed, i.e. feed the world’s growing population? This is the issue which was discussed in Trento, where the Indian activist and scientist was present on April 12, on the occasion of the 10 years of activity of the association L’Ortazzo. Will a change of cultural paradigm also be necessary to accomplish the transition? Vandana Shiva was interviewed by journalist Stefano Liberti during Poietika art festival, which took place on April 9 in Campobasso. Dr Shiva was also a guest of the Valsusa Film Festival in Turin on April 13. For decades chemical fertilizers and pesticides have contributed to contaminate land, water and air. They are poisoning the inhabitants of rural areas and all those who eat food grown on contaminated land. The failure of such a model of agriculture is now in the public eye. The agriculture of the future respects life and the Earth. Ecological food systems based on solidarity and circular economies are developing everywhere in the world. These are real experiences that show that agroecology is now the only way to produce healthy food, reduce waste and inequality, contrast the climate crisis and defend people’s food sovereignty, by putting citizens’ health and the future of us all first. Learn more about our work on Food for Health in our Main Themes area.